Manteigas is located in central Portugal in the heart of the Serra da Estrela Natural Park. The Estrela mountain range runs right through the park providing visitors with some of the most dazzling scenery they will see in Portugal. It is not only exceptional for its diverse and unique elements which provide a setting of great beauty, but the sense of tranquillity you experience whilst there is a huge draw for many of the tourists that visit each year. The Serra da Estrela Natural Park is simply a hiker's paradise with trails you can follow that shepherds have used for centuries, passing through villages that have barely been touched by modern life. This vast park is made up of pine forests, natural lagoons, and deep u shaped valleys which were carved by glaciers. The Rio Zezere valley is one such valley and is considered one of Portugal's seven natural wonders. Back in 5000BC during the Neolithic period small communities sustained themselves with game hunting. The first Neolithic settlers also introduced sheep herding to this region. History also tells us that Julius Caesar marched his army through this region in 50AD. This whole area is rich in legends and many of their traditional methods, particularly weaving, goes back to the early 12th century. In fact the recipe used to produce the local Estrela cheese is more than 2000 years old and is made from cardoon thistle and raw sheep's milk. 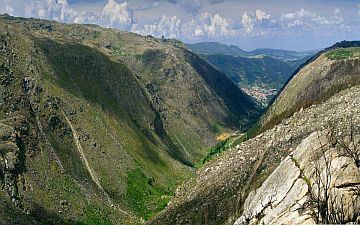 Manteigas is located in the Estrela mountain range. The municipality of Manteigas is made up of four parishes, two of which were formed in the early 14th century and most of the community originally survived on sheep farming. Sabugeiro, which is not far from Manteigas, is the highest village in Portugal and began as a group of shepherds huts where flocks of sheep and goats were kept. As the village grew eventually the humble shepherds huts were replaced with houses built from granite. Today it is a hot spot during the ski season with several restaurants and shops. It is equally beautiful in summer though as it is surrounded by waterfalls and panoramic views. The main attractions in the village are the Ethnographical museum, the water mills, and the Fonte do Ferreiro fountain. Another interesting day trip from Manteigas is the town of Gouveia which is to the north. For those who love history and culture, Gouveia is filled with beautiful architecture and has an excellent modern art museum. There is also a wide range of outdoor pursuits to enjoy such as mountain biking, fishing, and hand gliding. You can even get a wonderful bird's eye view of the area by helicopter or hot air balloon. As mentioned earlier, during the winter months the park also has the only skiing facilities in the country. Penhas da Saude is a winter resort only 10 minutes away from the Vodafone Ski Resort and consists of a hotel, hostel, and mountain chalets. Depending what time of the year you come there are also several events held in Manteigas such as a local carnival and the Expo Estrela which is an event that promotes local crafts, and includes plenty of food and live music. Should you be looking for suitable accommodation only 21km from Manteigas is the Pousada Serra da Estrela which is exceptional for its peaceful surroundings and amazing views. There really is no better place to stay if you are looking for a tranquil atmosphere and excellent mountain cuisine.